I am nothing if not a personal growth and development junkie. Even as a child, I asked for books on topics that even some hard working professionals have to force themselves to read. For whatever reason, I distinctly remember in 1998 waiting with baited breath for the latest John Maxwell title “The 21 Irrefutable Laws of Leadership” to be published so I could get my hands on it. It still, to this day, rocks my world. I definitely recommend that if you have not yet read the book, you owe it to yourself and everyone around you to do so. The memory of receiving that specific book at that time is so vivid to me because my dad was a member of Maxwell’s VHS and cassette tape club much of my childhood and to me there was no one smarter, determined, or loved by others than my dad was. I know those words expose my age even though my youthful glow does not. VHS and Cassettes! What excuse do we have now with the capabilities of all the audio files and knowledge in the world in the palm of our hands? Law #1: The Law of the Lid – Leadership Ability Determines a Person’s Level of Effectiveness. To reach the highest level of effectiveness, you have to raise your leadership lid. Essentially, you are your own worst enemy or biggest asset. What are you doing right now, today, at this very moment, at this very hour (outside of reading my amazing words of inspiration and gleaning from my deep wells of knowledge) to improve upon yourself so that you can go further? We love to think that the things that hold us back are outside of ourselves. This way we can blame people, places, and things for our inability to produce rather than take a cold hard look in the mirror. Like children, sometimes we can’t move beyond the slight discomforts of action and execution to gain the bigger prize of accomplishment and achievement. I have amazing sons, but this competitive and argumentative list of excuses could go on for eternity when all of the disagreements and conflicts just boil down to the fact that no one wants to accept responsibility and just move forward. Even when I say, “You aren’t in trouble. I just need to know”, the human experience dictates that self-preservation is preferable to self-awareness. At the end of the day what does this mean to you and me? Immediately stop telling ourselves false narratives. While other people, places, situations, scenarios, and things inform our daily life and decisions, they are not in control of them and they do not hold the keys to our success and destiny. Identify where the ceiling is. What is truly holding you down? Once you identify your ceiling, the things that you once thought were ceilings will become floors to your next level of personal growth and development. Establish personal responsibility and growth as a core value from which you make all of your decisions. Core values are constant. They are not descriptions of the work we do or the strategies we employ, they are just simply the basic elements of every day of our lives. 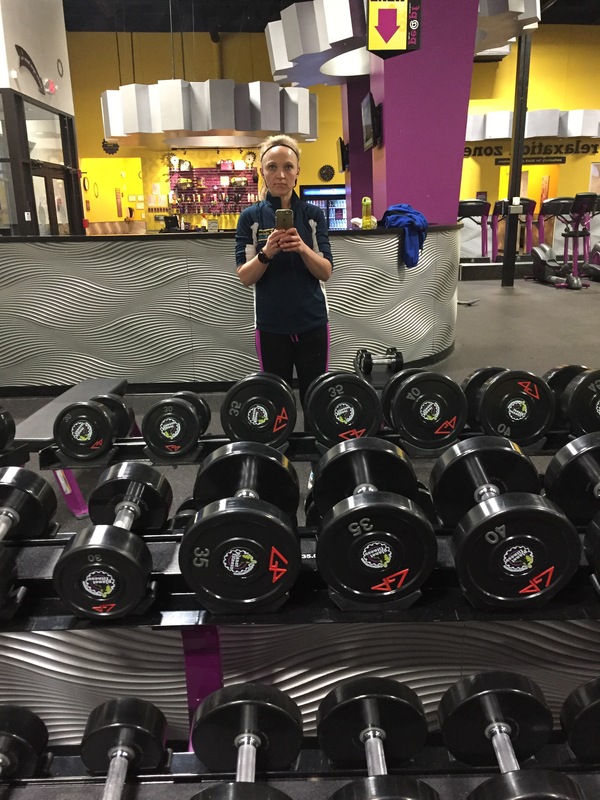 In 2010 when I started my fitness and weight loss journey, physical health and being in shape started to become a core value of who I am. I don’t run. I am a runner. I don’t just fit in exercise. I am a physically fit person. See how that wording shifts the conversation? If you just say, “I run”, you can easily dismiss the act of running if you don’t fit into your day. However, if “I am a runner”, it is the essence of who I am and I make it happen. I don’t just “mother” my children. I am their mother. There is actually a big difference. Anyone can “mother/nurture” them in a pinch or for a moment in time (School teachers. Babysitters. Grandparents. ), but nobody else in this world can be their mother. It flows from my essence. To begin exploring your own values and begin taking the limits off what you are capable of, think about your life and all of its components and begin rating them. Things I value very much: These are the things that are your very ESSENCE. An example for me is my physical fitness. Most people don’t value this as much as I do and therefore make excuses about why they can’t or won’t engage in daily exercise. Things I value: An example of this for me is financial gain. I do value financial gain and I want to be a wise steward of my family’s income and spend with frugality, however, money is not a top priority for me. I don’t value it enough to chase it over something I value very much. Things I don’t value very much: An example of this for me is a jam packed extracurricular social schedule. Every aspect of my daily life and work is to be surrounded by people and in relational and social settings, as well as run like wild, dragging kids between sporting events, hangouts, and practices full of even more people to socialize with. Because of this, I oftentimes neglect getting into social settings that aren’t work/ministry/leadership/parenting related because I value a little silence here and there. This can be a slippery slope because I know I need my relational cup filled instead of always being the one pouring, so I’m working on balance, but the point is, you most likely won’t find me at a RAVE until 2-3AM every Friday and Saturday craving a party. I will continue to write about personal development, growth, and life changing transformation, as it is my sweet spot, I have experience in and with it, and I think it is fun to be encouraged and challenged. That said, Are there any particular topics or avenues in this space you would want me to cover? I want to say that I’m pretty excited and proud of myself. I was given the highest compliment that anyone can bestow upon a Proverbs 31 lady of God. I was told that I display none of the typical mid western bloat/swell and that I look like I’m from the west coast. I only had to run 530 days in a row to warrant such a compliment, so it’s a pretty big deal. I frequently encounter wildlife on my outdoor runs. Between the deer population, wild turkeys, and Canada Geese, I have my fill of beauty to behold and pests to ignore. Bugs, snakes, worms, and birds all fill my day. To be honest, this was shocking to me at first because I live in a metro area not the country. Jonathan has even been attacked by a pack of turkeys one block from my highly populated neighborhood. Even an avid pet lover could fill with disdain if they frequently worked out outside. I promise you every pet owner thinks that their pet is the cutest and most friendly little thing in the world. Today I encountered not one, not two, but three unleashed dogs. All three owners were grinning from ear to ear as they strolled down the sidewalk with their pet untethered at their side. One of the dogs nipped at my ankle for an entire quarter-mile while their owner stood, unmoving, in the driveway simultaneously grinning and yelling at me about how their dog is just having fun and means no harm. I had to literally stop, turn around, and run that dog back to its owner (.25 miles back and then .25 back to where I was to start with) just to be told that my running was the cause of the situation. 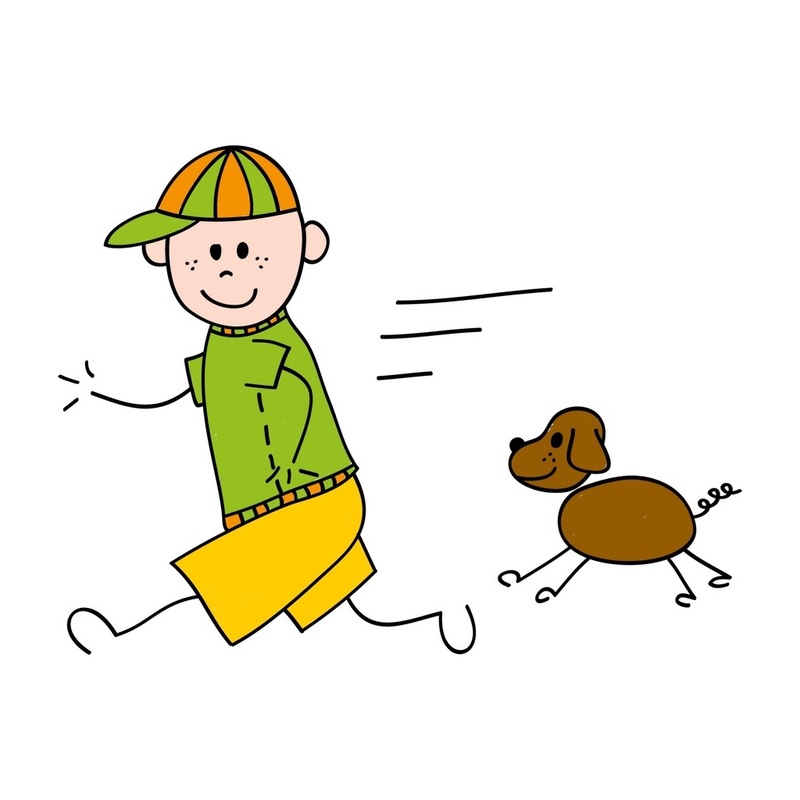 I will tell you that as someone who is definitely not an animal lover and, is in fact apathetic about pets, somebody on their daily exercise routine is not at fault for making your animal run. They are animals. That is what they do. They may be cute. They may be trained, but deep down inside they are wildlife and should not be allowed to roam untethered and free while you stand totally still laughing about it. If this was still 1990 you may have been the unwilling star of “Animal Attacks” on Fox. This has been a public service announcement. No animals or humans were harmed during the recreation of this event for your consumption. My God promises me that the lion will lay next to the lamb, because if not, I don’t want to take a victory lap on that side of glory. Today was day 530 of my Run Streak and an absolutely gorgeous, sunny 7 mile run ended with a 1 mile walk. I read in Hal Higdon’s book that adding a walk to the end of every medium to long run will help you avoid injury. I read that book when I could hardly even move because I was suffering from Achilles Tendonitis. My expert opinion is that this works. It just gives your muscles and body a chance to cool down and process all the blood and oxygen through the system and gives you a minute to return to normalcy. You only need to walk .25 miles at the end of a medium to long run to see the benefits. I swear by it. In fact, when the weather is decent, I will gladly run 14 miles just to be able to stroll 1 mile at the end of it. I love to walk and it is usually during this .25-1.5 mile walk that I have my deepest and most amazing thoughts of every day. 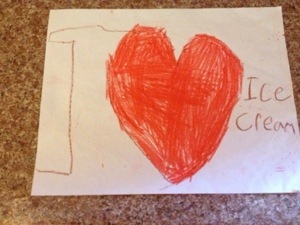 I found this drawing and couldn’t help but display it prominently. It means as much to me as Reese receiving a graduate degree from Harvard would mean. The amazing intellect and good taste that Reese displays with his word choice is uncanny.That’s a boy that knows what is important. He has his priorities straight. 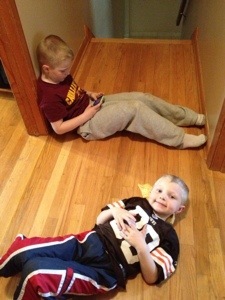 Reese and Gentry chilling on a Saturday afternoon. I definitely think Gentry has a career in fashion design. Look at the amazing outfit he chose and his color blocking skills. 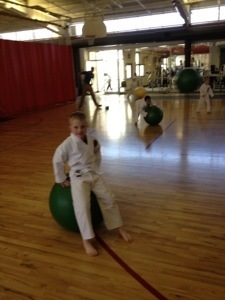 Reese taking a break during extreme dodge ball at Karate this morning. In closing, Saturday nights always give me a rush of excitement and adrenaline. Not only can I never sleep because I know the hope and potential of every service, but I can’t wait to get to The Bridge Church and hear this hottie preach tomorrow! 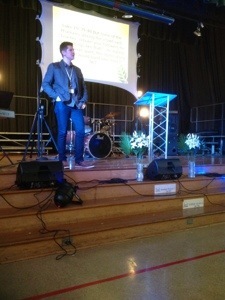 Not only is he an amazing pastor, but he is easy on the eyes. Is there a night of the week that you can’t sleep? Why? What is on the docket for your dinner tonight? I am back to clean eating today, sorry to disappoint all of my fans who thought for a moment they could be eating french fries, giant sandwiches, cake, restaurant food, and all of the other random things I’ve blogged about and be able to maintain a fit, healthy body. Remember, I’m a daily work in progress. I will never gain the 55 pounds back that I lost and that takes focus, dedication, commitment, and throwing away all clothes that give you room to breathe. Knowing I will have no skirts to put on for church tomorrow if I have one more bad eating day motivates me to put a stop to the birthday week celebration train! One day a week where you indulge, and one weekend or week here and there will not kill you, it is the daily and overall habits and choices that will.